Home » Create a bespoke entrance at your next event. First impressions count! Regardless of your exhibition industry sector, when attendees come along and go through your visitor entrance, you want to “wow” them, and for passers by you want to grab their attention and make them wish that they could visit your event too! You never get a second chance to make a good first impression. Fortunately, the team at Visions Group can show you that it isn’t as hard as you might think. 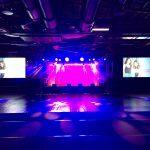 Our creative team can create that “wow” effect every time someone visits your event. Working with Visions you have access to a wealth of innovative ideas and solutions that will create show-stopping entrances that enhance your exhibition branding and identity. 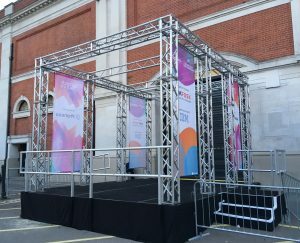 From supplying a marquee or truss or maybe a simple archway or an LED-illuminated tunnel, we can produce grand entrance ideas that create a significant impact from the very start to ensure that your visitors have a lasting impression of your event. We further maximise your brand identify through use of colour, lighting and technology.